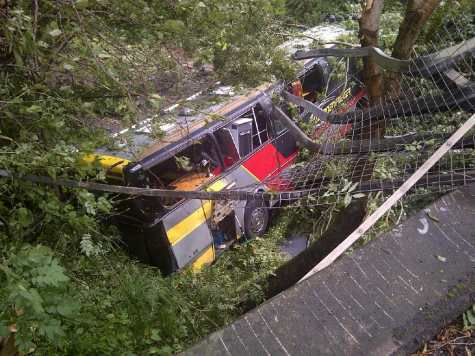 Two people on a tour bus used by Baroness were badly injured when the vehicle fell 30 ft (10 m) from a viaduct near Bath in UK. Emergency services were called to Brassknocker Hill, in Monkton Combe, on the B3108 at its junction with the A36 Warminster Road at 11:30 BST. Two of those on board suffered multiple fractures and had to be freed by firefighters. Seven had minor injuries. All remaining dates of the band’s European tour have been cancelled. The group played at The Fleece in Bristol on Tuesday evening and had been due to appear in Southampton later. Baroness’s tour promoter said: “It is with great regret that we have to inform you that Baroness were involved in a very serious road accident earlier today and will not be able to perform at Talking Heads tonight. Baroness was formed in 2003 in Savannah, Georgia, and has toured throughout Europe and the United States. They have also played at a variety of festivals, including Coachella and Bonnaroo in the United States. An Avon and Somerset Police spokesman said the crash involved a coach which had left the road with about nine passengers on board. One of the pair who suffered multiple fractures was taken to Frenchay Hospital in Bristol and the other to the Royal United Hospital in Bath. The seven with more minor injuries were taken to the Royal United Hospital (RUH). “Seven casualties moved to the Royal United Hospital will not leave hospital tonight,” an RUH spokesman said. Eyewitnesses said they heard a loud bang and rushed to the scene. Site manager Tony Cook, 61, was one of the first people to arrive as he was working at a property at the bottom of Brassknocker Hill. Tony Cook said: “At the top of the hill it is quite windy so they were going quite slow and seemed to be taking it quite carefully. He added: “When we got down there the driver was hanging out of front of the coach, but his legs were trapped so we had to free him and get him back and comfortable. “Then we got some ladders down there so that the people that were conscious inside could get out. Another witness, from the Angel Fish restaurant on the viaduct, said the coach had “fallen off” the viaduct at the traffic lights. Heavy rain in the area reduced visibility and it was not possible for the air ambulance to land. The A36, which was closed between Bath and its junction with the A366 at Farleigh Hungerford for most of the day, has now re-opened.